Officers have been seen to help assist women and carry kids over the ditch that crosses between the two countries. These kind actions of helping families seek asylum by illegally crossing the border has received tremendous media attention. “They tell us they are interested in the story because of the way we treat them when they cross the border. For us, it’s a crime. We arrest them. We do our police work. But in other parts of the world they aren’t as warm as here in Canada.”+++ The kindness that Canada has shown the world has been a great source of debate between Canadians who take pride in their generosity and those who have more conservative views on the subject. Kevin O’Leary is a Conservative leadership candidate who reportedly said he would use the notwithstanding clause of the Charter of Rights and Freedoms to ensure people who “sneak across the border” will not be able to claim charter protections and receive Canadian benefits+++. Another leadership candidate, Maxime Bernier, vowed that he would deploy the military to border points such as Rodham Road. Both candidates have made their voices heard on their opinion of the asylum seekers. 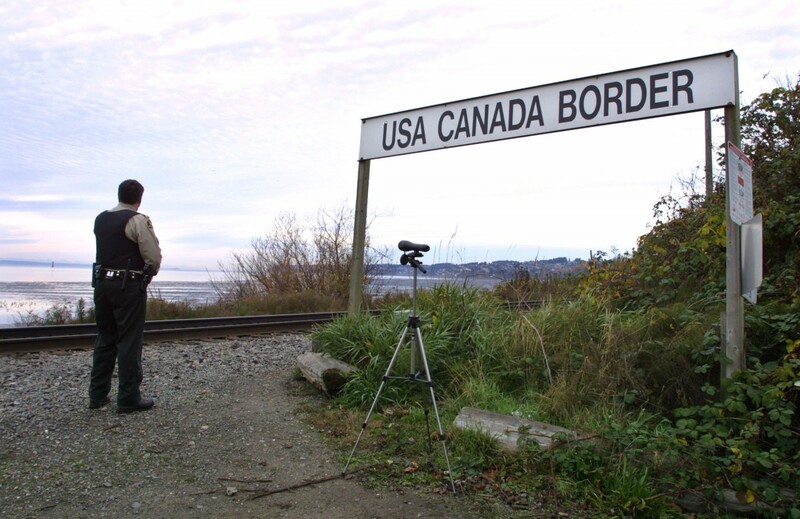 Many people believe the people who are crossing the US-Canada border illegally are tapping into the loophole that Canada provides. Canada is part of the Safe Third Country Agreement which allows a person to make a refugee claim in Canada as long as they do not enter the country at an official port of entry++++. So once the refugee passes through a non-official port, such as the Roxham Road, they are taken in and processed as a refugee who can claim refugee status to stay in Canada. Immigration Lawyers have taken it upon themselves to represent many of these asylum seekers. Eric Taillefer, a Montreal immigration lawyer, has represented many of the travelers who pass through on the Roxham Road. “What the agreement does, it forces people to enter Canada by any means that they can find, whether it be hiding in a car, crossing through the woods or finding any other kind of method of crossing.” Immigration specialists say that although the agreement does increase numbers of illegal immigration if the contract were suspended it would double the number of legal refugees in Canada. Plattsburgh Cares is a coalition of social groups, faith-based organizations and others in the city about 25 kilometers south of the border who are trying to stop anti-immigration ideals. Jo Ellen Miamo, one of the founders of Plattsburgh Cares, says “Our hearts are really broken that this has tarnished who we feel we still are. The best thing we can do is articulate that we are determined to hang on to the values that are fundamental to the United States of America. Another one of the Plattsburgh Cares founders, Carole Slatkin, added: “Somehow this country seems to have lost sight that it was founded by immigrants.” Out on the Roxham Road, these asylum seekers are not waiting to see if America can grasp that idea again but instead are immigrating to Canada for a better chance at life. Even though statistics have shown more Americans are being turned away, Canadians have taken into their own hands the dangers of traveling over the U.S. border. The Toronto District School Board, which represents over 245,000 students in its district, has suspended school trips to the United States. The board officials allegedly blamed Trump’s past travel bans which banned future visitors and immigrants from Iran, Syria, Somalia, Sudan, Yemen, and Libya. “We strongly believe that our students should not be placed into these situations of potentially being turned away at the border,” the Toronto District School Board director John Malloy said+++++. Fill out our FREE online immigration assessment and we will get back to you within 24 hours.